Over the last decades, agricultural supply chains have become more global, and tightly coordinated/driven by a small number of food companies and retailing chains that connect agricultural producers with an ever-growing population of consumers. 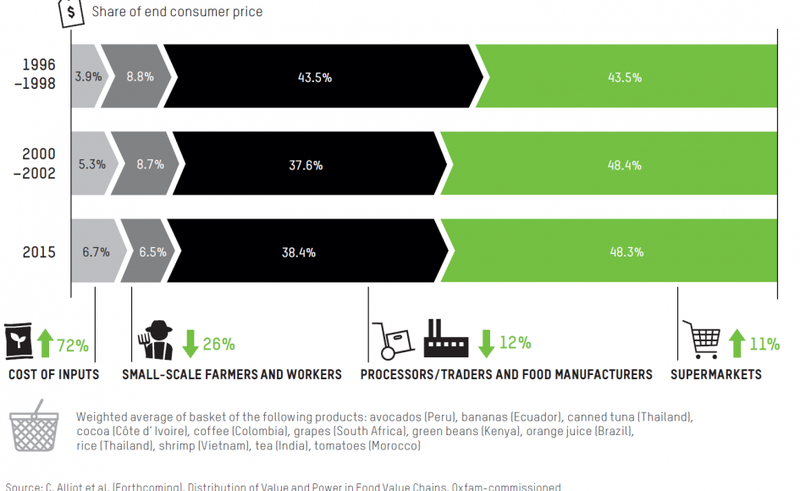 In this context, we have conducted for Oxfam International a research on the value distribution – from farmers up to consumers – across a basket of food products purchased by international retailers, and an assessment of the necessary changes to ensure that small producers and workers can achieve a sustainable livelihood. It provides for the first time quantitative estimates of the value breakdown within supermarket supply chains over the past 20 years, in 7 consumer countries (USA, Germany, UK, Netherlands, South Africa, Thailand and Indonesia) for 12 food products (coffee, tea, cocoa, rice, shrimp, tuna, orange juice, banana, grape, green beans, tomato and avocado) sourced from 16 producer countries. It also assesses the gap between the current income/wage earned by small producers/workers, and the living income/wage that would be required for them to reach decent living conditions. Eventually, it analyses these numbers in the light of the power relations and governance of the related global value chains. The results offer new evidence that the socio-economic conditions for small-scale farmers and workers have worsened over the past 20 years, largely to the benefit of supermarkets and to a lesser extent international brands, and are likely to deteriorate further in the years ahead in a business-as-usual scenario. A point of no return might be reached in which the very viability of small-scale farmers supplying supermarkets is in question, with increasingly precarious forms of work. The rights of millions to a decent standard of living, as well as the natural environment, are likely to be at stake in the short to mid-term.